The AEM 28-20252 fits some BYD F3, BYD F3R, Great Wall Voleex V80, Lotus Elise, Lotus Exige, Pontiac Vibe, Pontiac Vibe GT, Scion tC, Toyota Allex, Toyota Allion, Toyota Avensis, Toyota Avensis Verso, Toyota Caldina, Toyota Corolla, Toyota Ipsum, Toyota Isis, Toyota Matrix, Toyota Matrix XR, Toyota Matrix XRS, Toyota Noah, Toyota Opa, Toyota Premio, Toyota Verso, Toyota Voltz, Toyota Voxy, and Toyota Wish models. See vehicle applications for details. 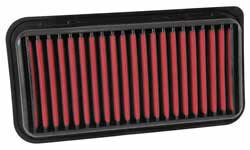 I purchased this air filter to replace the foamy OEM on my 08 Scion TC, I figured I had already spent more money on the stock ones. Plus I didn't want to spend a lot on a cold air intake since I don't autocross my car, its just my daily driver. I have this product in my car for about 2 weeks now and I love it, I can really feel the difference on midrange RPM, a bit more responsive. If your looking into something like this without having to replace to whole assembly for an cold air intake I definitely recommend this product. 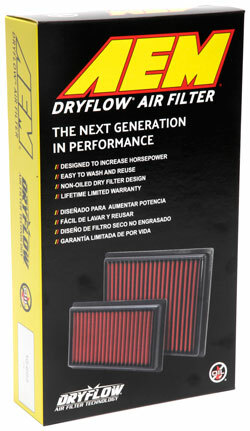 This product delivers what it says it does plus I don't have to buy filters all the time just clean it and pop it back in, it fits just like the OEM.